Trading Hours Friday, Saturday, Sunday, Monday from 11am to 4pm. Public Holidays (except Good Friday,Easter Sunday,25th & 26th December, 1st January) from 11am to 4pm. But will be open on Easter Saturday and Family Day on Monday. At Saggy Stone we can offer you 2 options, from a budget wedding to rent in all your own tents, décor, band ect. Wedding at the Restaurant, available from 16h30, Fridays, Saturdays and Sundays. Rent the entire restaurant and pay one fee for it all, (standard menu not available, inhouse catering only) simply provide us with your preferred menu and we will quote accordingly. We can also supply you with sample menus should you require some guidance on choosing a menu to suite your taste and budget. All alcoholic and other beverages have be ordered from the standard menu. There will be a 20% corkage fee on the total value should you choose to source your own wine and bubbly. # Smoked chicken wings with a spicy dipping sauce, hummus and pita bread. # Spit roasted leg of lamb or whole lamb for 30 people and more. # Barrel smoked pork belly. # Roasted potato and onions. # Moroccan red and white cabbage salad. Homemade gelato ice cream with a ginger biscuit crumb. 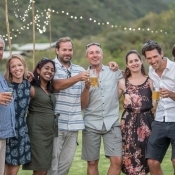 Whilst in a Jacuzzi, brothers Adrian and Phillip Robinson, decided to buy a fruit farm situated in the heart of Nuy Valley, west of Robertson in the hopes of turning its grapes into wine and exporting its fruit overseas. 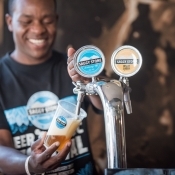 They changed course after travelling through Australia, where Phillip noticed a trend of microbreweries scattered in the Outback’s vineyards. This gave him the inspiration to become Robertson’s first “beer-brewing farm”. Their dream kicked off in 2007, with a couple of experimental kit beers made for friends and family. 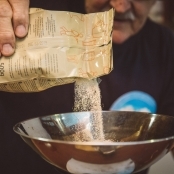 A combination of Phillip’s recipes and Adrian’s 12-year stint as a baker, ensured they perfected the art of brewing using the all-grain brewing method, while discovering that the pure mountain water on the farm made the perfect pint. Content with the outcome three years later, the plan was to distribute their beer to pubs but this left them feeling unsatisfied. 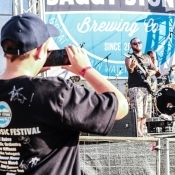 Not knowing or being able to see how beer drinkers received their beers resulted in the birth of Saggy Stone Brewpub in 2010. 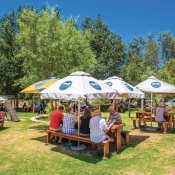 Set amongst the plum orchards and built from natural river stone found on the farm, this pub puts the “craft” in craft beer. 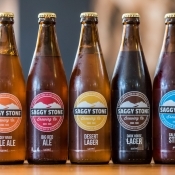 Today, Saggy Stone offers 5 distinctively different and satisfying brews, the result of using only natural spring water found on the farm and taken from the head spring at the top of the Langeberg Mountains. This pure, moss-filtered spring water that flows over the smoothest granite, is the key to a great tasting craft beer and as the brothers know, great mountain water, makes better beer. While under construction, a troop of over-zealous baboons danced on the walls of Adrian’s gabion style lapa, causing the stones to sag. On inspection, his then 10-year old daughter called it “The Saggy Stone Lapa”. The name stuck, not only as a charming story but one that is as natural as Saggy Stone itself. To find out more about our kegs and beers, please contact us using the form. Set in the plum orchard and built by Adrian himself, the stone-walling effect and wooden-decked building now known as Saggy Stone Restaurant & Pub blends into the environment. It offers a homely, up-market setting that’s comfortable and relaxing. The bar is made from a huge chunk of reclaimed Gum tree to reflect its eco-friendly nature. Surrounded by lush green grass,a central pond and a kid’s jungle gym, Saggy Stone offers a family-friendly location where parents can relax and soak up the spectacular mountain views while kids (and dogs) explore the area. Guests are also encouraged to help themselves to ripe plums. 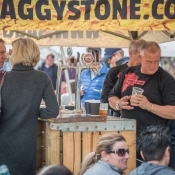 Before ordering, guests are treated to a “tasting” of Saggy Stone beers so everyone can find their favourite. The menu caters to everyone, from home-made burgers and Adrian’s favourite, peri-peri chicken livers, done the way he loves to do them, to a beef and ale pie, eisbein or fish and chips, all cooked using Saggy Stone beer. The restaurant is known for its generous portions and rustic style cooking that tastes like home. 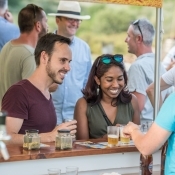 Saturdays are for chilling and enjoying some live music out in the country as you sip on a Saggy Stone draught. Click here to go to our Facebook page for an update on our upcoming entertainment and events. Friday, Saturday, Sunday, Monday from 11am to 4pm. We are open all Public Holidays (except 24th, 25th & 27th December & 1st January) from 11am to 4pm. What a great feast, we booked for 20 people R3600 at first glance looked like a lot, but once you see what you get for only R180 per person, the quality and quantity of the food, it is an absolute bargain, thank you for a lovely day and see you soon again at Saggy Stone, looking forward to the snoek braai!